Each morning, usually after a long walk on my farm, I go upstairs to my office and pull out three small notebooks. In the first one — a small blue gold leafed notebook — I write one sentence about the day that just passed. In the next, a black moleskine, I journal two quick pages about yesterday’s workout (how far I ran or swam), what work I did, any notable occurrences, and some lines about what I am grateful for, what I want to get better at, and where I am succeeding. And then finally, I pick up The Daily Stoic Journal to prepare for the day ahead by meditating on a short prompt: Where am I standing in my own way? What’s the smallest step I can take toward a big thing today? What blessings can I count right now? Why do I care so much about impressing people? What is the harder choice I’m avoiding? Do I rule my fears, or do they rule me? How will today’s difficulties show my character? The whole ritual takes maybe 15 minutes and then it’s done. By the time I am finished, I am centered, I am calm and most importantly, I am primed to do the actual creative work by which I make my living. Nor am I the only one who swears by this quiet, sober exercise — professional writer or otherwise. Some of history’s most respected men and women journaled in one form or another: Oscar Wilde. Susan Sontag. John Quincy Adams. Anne Frank. Ralph Waldo Emerson. Virginia Woolf. Henry David Thoreau. Joan Didion and of course, Marcus Aurelius too. (A full list would be impossible). I came to journaling myself from two very different paths. First, the Stoics were such ardent journalers that it is possible to say that journaling is Stoicism. (More on this down below). Second, I remember visiting the filmmaker Casey Neistat’s studio and seeing shelves and shelves of notebooks on one wall. They dated back to the very beginning of his career. I felt an instant pang of regret — why hadn’t I been doing this? — and then reminded myself that although the best time to start journaling would have been years ago, the second best time would be right then. So I did. And while it is cool now to have a record of my thoughts over the years, the real benefits have been far more immediate. But let’s go back to the Stoics, since that’s an essential part of my personal ritual and the main reason I picked up the habit. It seems that there were two camps in Stoic philosophy when it comes to journaling, or at least two approaches. Marcus Aurelius seems to have done his journaling in the morning, despite his noted struggles with arising early. From what we can gather, he would jot down notes about what he was likely to face in the day ahead. Literally walking himself through what the day would bring and what he would need to bring to the day. He talked about how frustrating people might be and how to forgive them, he talked about the temptations he would experience and how to resist them, he humbled himself by remembering how small we are in the grand scheme of things, and journaled on not letting the immense power he could wield that day corrupt him. If he hadn’t done this, who knows what kind of emperor he would have been (at the very least, we’d have been deprived of his brilliant Meditations). So that’s one approach. The other approach is found in Seneca, the more prolific writer, who seemed to do most of his journaling and reflection in the evening. As he wrote, “When the light has been removed and my wife has fallen silent, aware of this habit that’s now mine, I examine my entire day and go back over what I’ve done and said, hiding nothing from myself, passing nothing by.” He would ask himself whether his actions had been just, what he could have done better, what habits he could curb, how he might improve himself. Reviewing the day is what helped Seneca prepare for the one that would begin the following morning. It strikes me that the best approach would be to combine these two methods — to prepare for the day ahead and to reflect at the end of the day on how the preparation turned out. This is how Epictetus appears to have done his journaling. A former slave who lived a life not nearly as cushy or powerful as Seneca or Marcus, he says, “Every day and night keep thoughts like these at hand — write them, read them aloud, talk to yourself and others about them.” Anyway, that’s what I tried to do in creating The Daily Stoic Journal (there’s one prompt per day and spots to muse on it in the morning and the evening). I get it. This might all seem like a bit much. I was intimidated by journaling too. And people, I find, tend to intimidate themselves about it: What’s the best way to do it? What’s the best journal? What time? How much? Man, forget all that. There’s no right way to do it. Just do it. 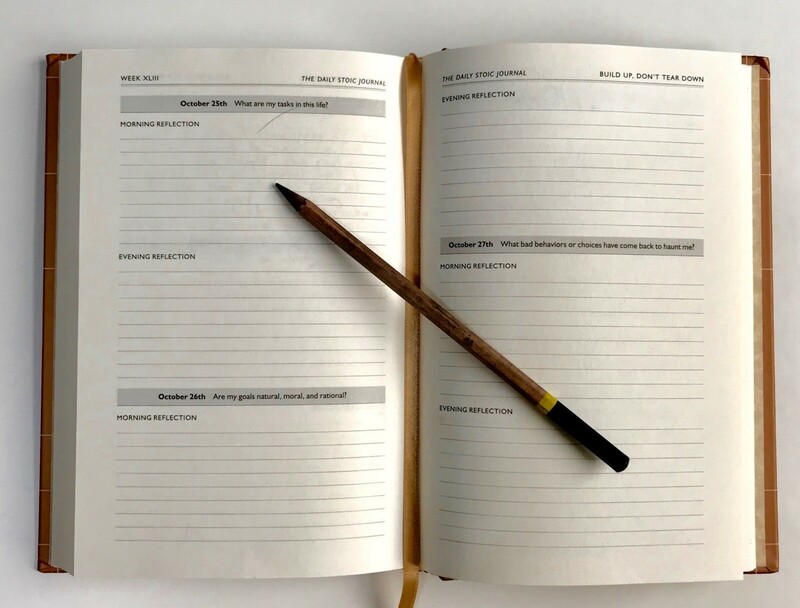 You can use The Daily Stoic Journal or The 5 Minute Journal or The Bullet Journal or Austin Kleon’s Steal Like an Artist Journal. Or the One Line A Day Journal. Or a blank notebook or an Evernote file or an email on your iPhone. Or use a combination of these things. It doesn’t matter. Just start. Refine and improve as you go. You’ll get into a rhythm and find what works best for you. But only if you actually start. Yes. That is what journaling is about. Spiritual windshield wipers. A framework for the day ahead. A coping mechanism for troubles in your personal life. A revving up of your creative juices. A way of calming nervous energy. Find what works for you. Once a day. Twice a day. Three times a day. Whatever. Just know that it will be the best time — the most important thing — you spend all day. 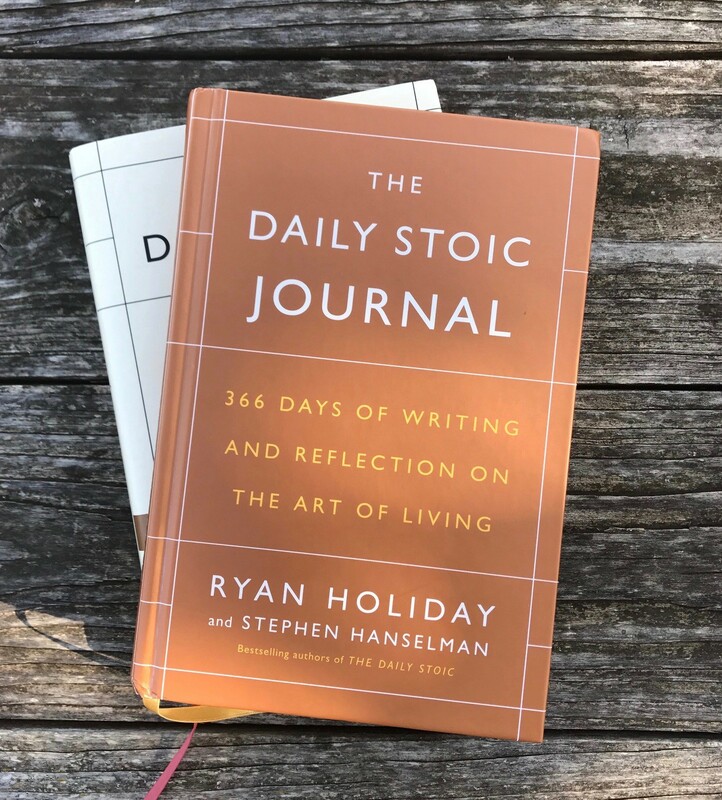 The Daily Stoic Journal is in stores now (B&N)(UK)(Indiebound)(Signed copies from Book People). I hope you check it out.